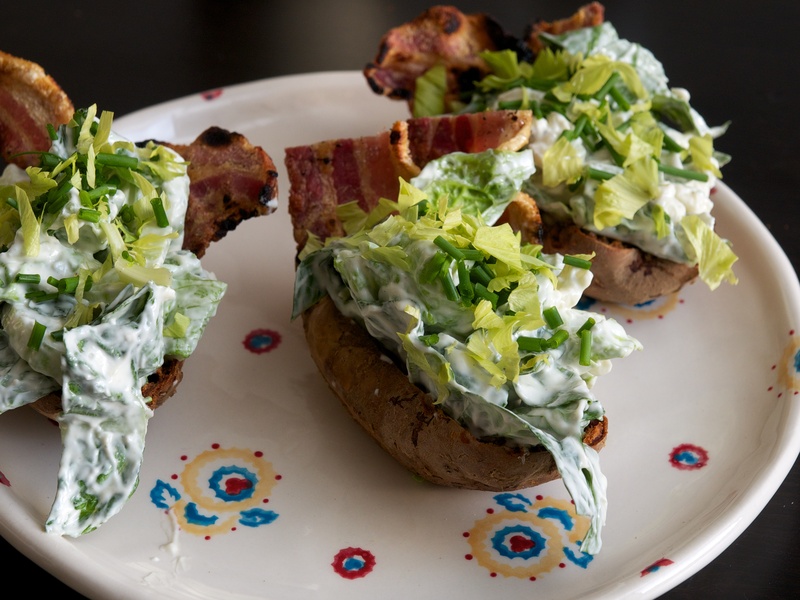 These super tasty bacon & blue cheese stuffed potato skins work well as a starter or a side dish. Probably best not to count the calories! Put the potatoes on a baking sheet and bake for around 1 hour 15 minutes or until soft in the middle and nice and crispy on the outside. When the potatoes are cool enough to handle, cut them in half lengthways and scoop out the flesh but be careful not to break the skins. Keep the scooped out potato to make something else with. Put the potato skins back onto the baking tray, drizzle with oil and put back in the oven for another 15-20 minutes or until really crisp and brown. Meanwhile, gently fold the crème fraîche, Roquefort and mayonnaise together for the dressing. Stir in the mustard and Tabasco and season. Cook the pancetta slices under a hot grill until crispy. Mix the lettuce and celery together in a large bowl then add the cheesy dressing. Put the bacon rashers into the baked potato skins and spoon the cheesy stuffing over the top. Garnish each one with some of the chopped celery leaves and chives and dust with paprika.